As members of the Timber Framer�s Guild of North America, Woodborne Design is a highly qualified timber frame design firm. We have a special interest in projects that involve the craft of timber framing and we�re particularly proud of our custom timber frame homes and community amenities. We view the timber frame homes and custom timber frame structures we design today as gifts to our children and grandchildren. Timber frame structures make brilliant use of a renewable resource and are endowed with qualities that allow them to endure in our hearts and in our lives for generation after generation. 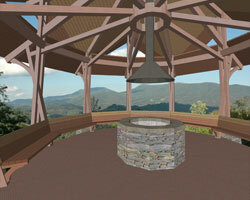 We love that timber frame structures do not need to be covered up or embellished by superfluous architectural detail. 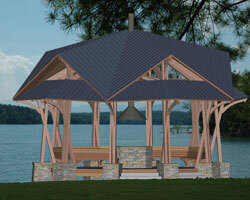 The inherent beauty of timber frame construction is derived from the efficient structure and natural beauty of wood. At Woodborne Design, we�ve made it a point of pride to be well educated about the properties of wood species. We approach every timber frame design decision with great care to achieve superior long term performance and a lasting aesthetic sense of harmony with nature. Over the years we�ve acquired an extensive understanding of timber frame construction. We�ve spent a great deal of time developing relationships with timber craftsmen, learning about the way timber frame structures are cut from individual timbers, how they are assembled piece by piece, and becoming keenly attuned to the many special considerations of timber frame construction. We build timber frame structures in our 3D modeling software the same way they�re built in the craftsman�s workshop; piece by piece, with precision and attention to every last detail. We model and analyze every connection to ensure your frame is structurally sound, easy to cut and assemble, and of course, beautiful to behold as a finished work of art. The timber frame home or structure you desire may not yet be fully formed in your mind, but rest assured, we at Woodborne Design have the tools and the talent to help you develop your love of timber framing into a real live custom timber frame home, addition, or other amenity. Whether the project involves traditional wood-to-wood joinery techniques, internal or external steel plates, other contemporary joining innovations, or a combination of all of the above, Woodborne Design is extremely well equipped to tackle any timber frame design challenge.